Cover pencils by Curt Swan, inks by Murphy Anderson. "The Forbidden Costume! ", script by Cary Bates, pencils by Curt Swan, inks by George Roussos; Two alien uniforms travel to Earth, one taking over Superman and the other taking over Perry White. Batman ad. Tales of the Legion of Super-Heroes back-up, "Lament for a Legionnaire! 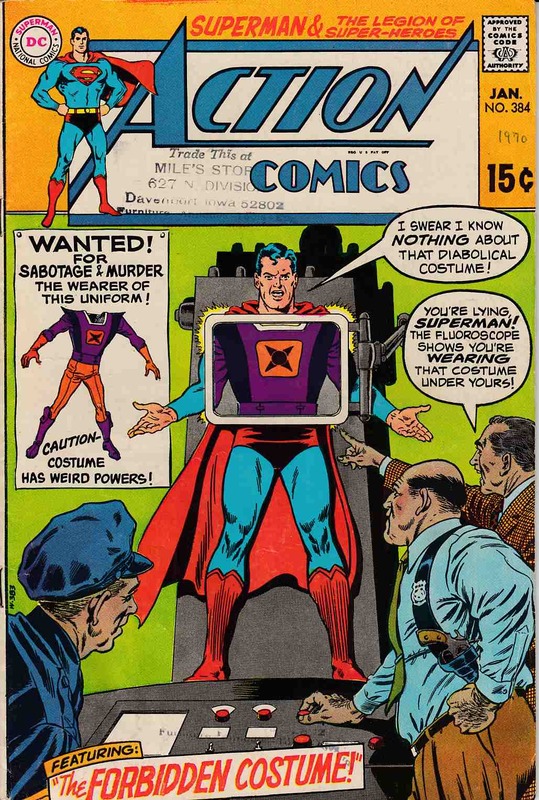 ", script by Jim Shooter, pencils by Curt Swan, inks by Jack Abel; When Dream Girl dreams of the death of Mon-El, the Legionnaires and even the planet of Daxam try to protect him; A descendant of his brother, Eltro Gand, takes his place, but Mon dies as a result of lead poisoning. *Grading Notes: large store stamps on covers and several interior pages. "1970" written in ink on front cover.